Reddit survey asked players what they want most in the next add-on. Continuing to backpedal themselves out of the SimCity debacle, EA is considering to offer players an offline mode in the future. A survey unleashed by Maxis described what could be coming at a later date, but wanted to know what the players wanted first. “Simulate to the Sky” will allow players the ability to build their cities upward instead of normally expanding outward, generating “SuperScrapers”. Multi-layered zoning, transportation, industry, residential, etc. aspects come into play here to improve an entire city’s population and density. “Greed Cities” will add resource-consuming corporations to help increase profits (using robots to do this) and increases their overall pollution produced, while “Green Cities” will add more educational institutions to develop newer, more advanced tech to generate a highly skilled workforce. “Transform Tomorrow” which allows players to view how their cities evolve and adapt to new technologies being added over the future. Making slight changes to a cities technology could prove useful or disastrous over time if not treated properly. 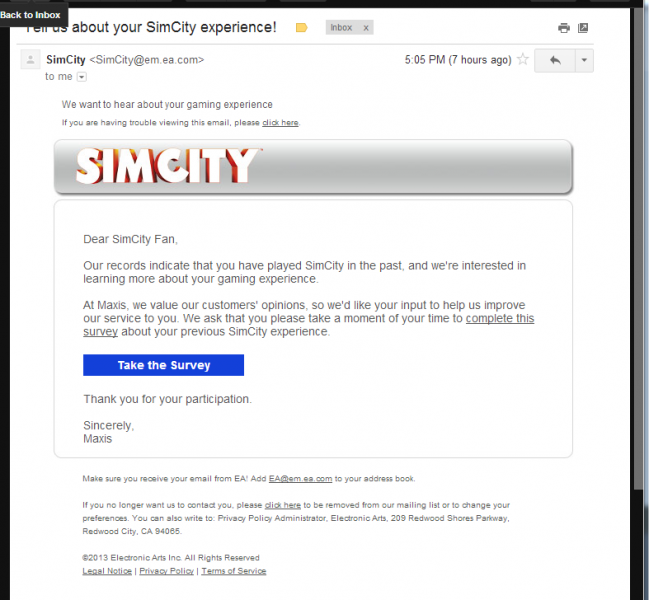 Using the mega popularity of Reddit to ask the consumer for feedback was a move Maxis will use to help reverse the damage done during the first few months after launch of the game, some of which is still felt to this day. Both offline and co-op modes sure sound intriguing and desirable, but do others think so? Hopefully the fanbase did their job as we currently await the results of the survey.